Don’t these look good? I must say I am very happy with them. I have made sesame snaps twice before. My first attempt was an unmitigated disaster. If you remember, I ended up with crystallised sugar. My second attempt was much better but I didn’t really like the taste. They tasted too much of honey, which didn’t seem right, and were very hard on the teeth. This time, I hit the jack pot. The recipe is dead easy to follow and everything behaved as advised. The recipe is from Chocolates and Confections by Peter P Greweling. I have mentioned this book several times on this blog. I highly recommend it for anyone interested in making confectionery at home. There are, however, two down sides to the book. It is American so all weights are in pounds and ounces and there are no metric conversions and, every recipe has corn syrup in it. Neither of these issues particularly worries me. It is easy enough to convert the pounds and ounces into grams, if need be, and I just replace the corn syrup with glucose syrup. Invert syrup is closest, chemically speaking, to corn syrup, which also contains fructose and glucose. Bring up to slow boil then simmer for 30 minutes. Cool before using. Anyway, back to the recipe at hand. These taste great, are better than my previous efforts and don’t break your teeth when biting into them. The actual recipe is for peanut brittle; sesame brittle is listed as an alternative. 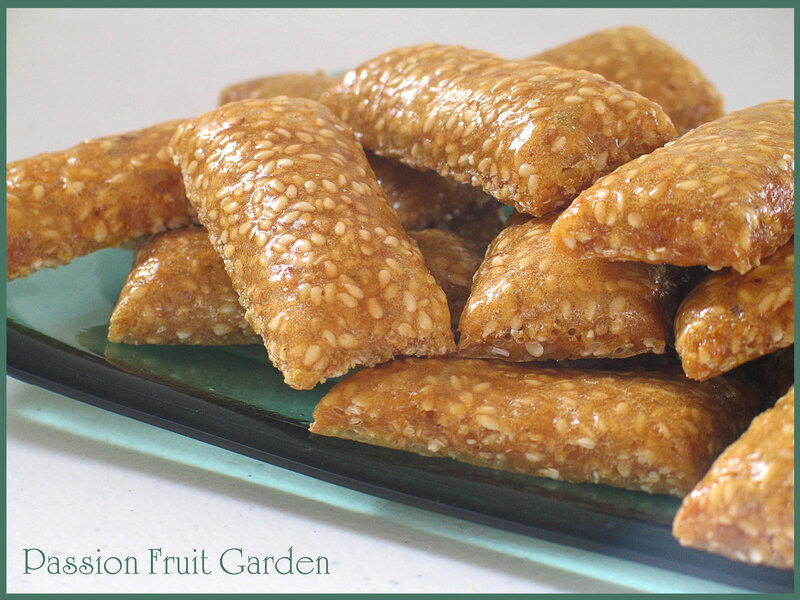 If you prefer peanut brittle, replace the sesame seeds with 1 lb (454g) of unsalted roasted peanuts. Another alternative listed is cocoa nib brittle. In that option, replace the sesame seeds with 4 oz (113g) of cocoa nibs. bi-carb soda, which aerates the brittle, again making for a more delicate crunch. This might explain why you can bite into this brittle without breaking your teeth. The recipe also includes salt which you may find a bit strange. Mr Greweling advises, it is added to bring out the flavour of the nuts or seeds and to provide a flavour contrast to the sweet brittle. As with all confectionery recipes, you will need a thermometer. 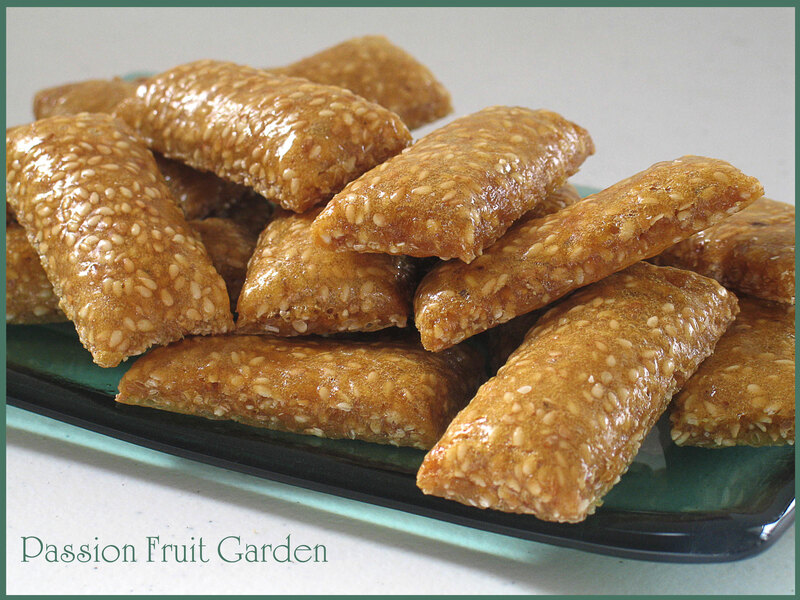 8 oz (227g or 1½ cups) sesame seeds. I used 2 x 250 mil cups. I wanted my brittle chock-a-block with sesame seeds. Line a baking tray with baking paper and oil a palette knife, set aside. Combine the sugar, water and corn syrup in a saucepan. Bring to the boil, stirring constantly, then cover and boil for 4 minutes. Remove the lid and cook, without stirring, until the mixture reaches 240°F (115°C). Add the sesame seeds and cook, stirring all the while, until the mixture reaches 320°F (160°C). It will be a light brown. Remove from the heat and add the salt, butter, vanilla, and bi-carb soda. Mix until thoroughly combined. Pour the brittle onto the prepared tray and spread to the edges (if you can) with the oiled palette knife. I found it near on impossible to spread the brittle so I just poured the brittle onto the tray, covering as much of the tray as possible. My tray is 38cm x 34cm and I filled most of it. Deeply score the brittle into bite size pieces whilst still warm. Allow to cool to room temperature then cut on the scored lines. This entry was posted in Sweet Things, Treats/chocolate and tagged Cocoa nibs brittle, Peanut brittle, Sesame snaps, Sugar re-crystallising by Glenda. Bookmark the permalink. I’ve always wondered how to make these! Glad you persevered. Now I have a recipe with all the wrinkles ironed out! Hi Debi, We have just finished them. Geez they were good. Hi Moya, the straight sugar and water varieties are a killer on the teeth. Hi Liz, it sure is good. Delicious. I love anything with sesame seeds. These look fabulous Glenda. Thanks for ironing out the recipe glitches and providing an alternative to corn syrup. I’ve book marked this recipe for the future. They are good Sandra. How has the move gone? We leave sept 1. I’ve had a massive clear out in readiness for the removalists to pack, I can’t believe that I had so much unnecessary stuff!